In her first season at the helm, Krimson Revis, above, guided the Patriots to a berth in the 2017 North Super Regional before the team was eliminated by Oxford. Journal file photos by Mark Almond. 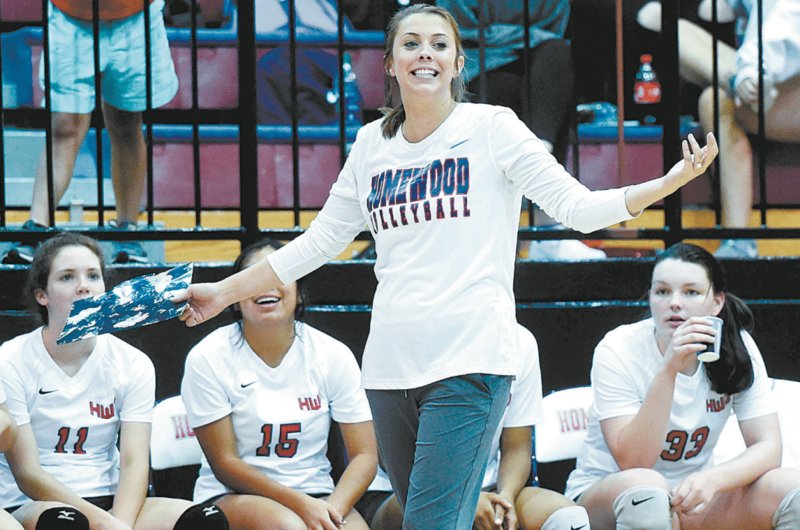 Homewood volleyball players aren’t exactly sure how to address their second-year head coach. That’s because Krimson White married fellow Homewood alum Hunter Revis in January and took his last name. Coach K, er, Revis laughs about her players’ quandary. 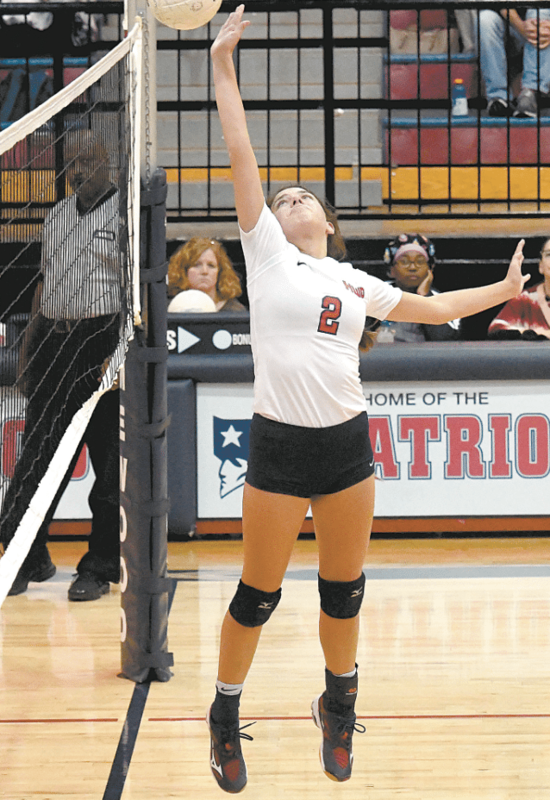 Revis, a former Homewood player, also is fine with the direction the Patriots’ volleyball program is headed. After serving as an assistant under longtime Homewood coach Carol Chestnutt, Revis was elevated to head coach after Chesnutt retired at the conclusion of the 2016 season. In her first season at the helm, Revis guided the Patriots to a berth in the 2017 North Super Regional before the team was eliminated by Oxford and finished with a 19-22 record. She is looking for bigger things in 2018, but she’s leaving it to her players to determine what their expectations are. “Last year I just spit them out, but this year we wanted it to be more of a player-led deal,” Revis said. “We’re concerned about them being the best they can be and believing in themselves. Loo said she and her teammates are setting the bar high. “I expect a lot for us,” Loo said. “Last year, we saw how three freshmen came in and played, and this year we have three more really good freshmen. We’re counting on them to make us better. Homewood senior middle hitter Alejandra Loo. The Patriots have more players on its roster this season. Homewood graduated three seniors, but three seniors returned this season – Loo, Carolyn Bodkin and Christina Wright. Homewood also has three juniors – Luz Rosales Perez, Gretchen Kellen and Kassidy Schnoer, a 6-foot, 1-inch outside hitter. “She plays basketball as well and she’s tall, but we call her our gentle giant because she has the sweetest heart,” Revis said. Four sophomores are also on the team – setter Abby Wilson, libero Emma Johnson, outside hitter Alex Hershbine and Jane Wilson. Hershbine and Jane Wilson are moving up from the junior varsity. Freshmen Haley Callaham, a setter, MacKenzie Yoakum and Olivia Brown round out the roster. Brown transferred from Advent Episcopal School. “She has the highest vertical (jump) on the team,” Revis said. Homewood will compete in Class 6A, Area 10 along with Shades Valley and Huffman. The Patriots open their season Aug. 28 at Vestavia Hills. “I am super excited,” Revis said. “All the coaches (including assistants Cynthia Padgett and Katelyn Collins) have been in their position for a year, and they know our system, and they know our players. The coaches and players all know what makes us tick.